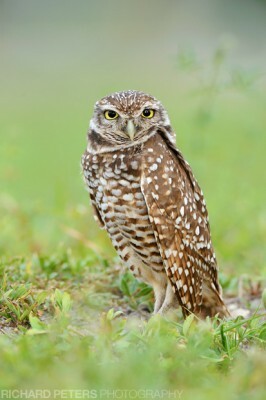 One species I had not seen before, but knew could be found in Florida, is the Burrowing Owl. So I decided to spend some time photographing them at a couple of locations in the sunshine state…as well as recording my first ‘On Location’ video to give you an idea of the conditions I experienced, and to give you some idea of what to expect if you decide to go out photographing these little guys for yourself. Burrowing Owls are funny little birds. They are only 9 inches tall and spend most of their time sitting at the entrance to their nests, keeping an eye out for food and predators. Florida’s population is estimated to be between 3,000 and 10,000 pairs and they are located at several specific areas, rather than anywhere and everywhere like other species you find in the sunshine state. They are listed as a protected species to help keep the numbers up, as in places like Cape Coral, they have built nests on empty plots of land. As a result developers have, in the past, disrupted nests so that they can build on the land the owls are occupying. There are several areas around the state you can find the owls nesting although, unlike other species, these locations are quite few and far between and so not quite as easy to just stumble across. I visited a couple of areas in my search for the owls, and to accompany this article, I made a video to show them – which you can see below (bare with me as I find my feet with this new skill that I am having to learn, it’s only my second video – shot with a Lumix TZ7 – but I do hope you enjoy watching…). You’ll notice I only talk about Cape Coral briefly and that is simply because I spent a couple of hours one morning trying to find the owls there. At the bottom of this article you can find links to websites that will give you more information about the owls and locations you can find them in to help you find some for yourself. I also wrote this article to better show some of the Burrowing Owl photos I took and also back up the video with more information. I hope you find it an interesting and useful read. This is probably the most well known location for seeing the Burrowing Owls in Florida. The city is well known for its population which is estimated to be over 1,000 and indeed, as you drive around the city you will see nests dotted all over the place. There is a toll to get on to Cape Coral so be prepared for that if you are visiting from further away…it’s only a couple of dollars but you don’t want to get caught out and have to go off looking for an atm when all you want to be doing is taking photos. The community of the city really do a lot to look after the owls nesting there, with various tips and advice on the protection and well being of the owls to be found on the Cape Coral website. It’s really nice to see just how much effort the city puts in to the conservation of the owls, but given how many of the entire states population live there it really is no surprise. Many residents have also put up wooden crosses by the nests for the owls to perch on, although I only saw one owl off in the distance perched up. The nests can be found all over the city and you basically just have to drive around looking for them. When you see one, depending on it’s location, you can simply pull up and take photos. As you may have seen in the video, many of them are found around the housing estates, which means you basically have to drive around the many residential areas to spot them. The nests are easy enough to see as they are marked with poles around them and usually rope joining those poles. Because many nests are on private property or in areas that you just cannot reach very easily you may not always be able to get close enough for a decent shot. The good news though, is that there are quite a few of them so it won’t take you long to find another that is a little more within reach of your camera. On the morning we drove round however, there were very few owls on show with most of them seeming to want to keep out of view or as hidden as possible with just a pair of eyes looking out at you. We did find a couple out in the open but we were at the mercy of the sunlight…and that’s your other problem…because a large amount of the nests are on private property you can only photograph them from one direction, which may not always be in the right position for the light. I liked Cape Coral, it’s a nice quite city with plenty of space and lots of owls to be found. I would have liked to spend more time there to really make the most of it though as my friend, fellow photographer Colin Pickett, spent a few days there and had more success. Although he informed me the time of day and various nests activity varied a lot, so it really does seem like it might be hit and miss as to whether you see them or not. As is the case with most wildlife, you just have to put the time in and hope you are rewarded with some sightings. By contrast, Brian Piccolo Park really did give me a lot more opportunities to photograph the owls. It really is the last place I would have thought to look for them though, as the park is purely there for recreational purposes with football (soccer!) pitches, cricket fields, basketball courts, a velodrome etc as well as picnic areas. No wetland area, no wildlife conservation area or anything like that which you find in many other parks around the state. This park is purely for the entertainment of the Broward County residents so it really did come as a surprise when I was told to look there for the owls. I was expecting them to be sparsely dotted around and hard to see but to my delight there were a good number of nests and almost every single one of them had at least one owl standing by the entrance…further more, on both the days I visited, the owls were showing well the entire time I was there. Shooting at the park is really good because the owls there seem much more approachable and accepting of people. I think because the park gets so busy and noisy at times, the owls have grown to understand that they generally are not in danger from the people that use the area, and so you can get close enough for some really nice images – with the owls being far less timid than the at Cape Coral. Again as you can see in the video, some of the nests are right up alongside the pathways and road that wind throughout the park which has all helped to make the owls grow used to the daily visitors. It’s worth pointing out that you should never take the owls trust for granted by getting overly close to them, but you can certainly get close enough that a 400mm on a full frame camera will get you some nice images (or 300mm on a crop body) – although I opted to use my 1.4x TC on my 200-400 because I prefer to stay further away from my subjects, as airing on the side of caution is always the safest bet. The owls always seemed comfortable with my presence though and mostly ignored me and spent most of the time doing what they do best, observing the area around them and moving their heads in all directions to keep an eye on things. The other advantage here is that you can get to any side of any nest with ease, so you are always able to shoot with the light in the best possible position. It’s also worth pointing out there is a fee to get in to the park depending on the day you visit, so bare that in mind. Full information about the park and it’s location can be found below. I had great fun photographing the owls in Florida, they are funny little characters, although they don’t do a huge amount so don’t expect any action shots – although I did have one fly between two nests, straight past me…I was totally unprepared for it so missed the chance to photograph it, typical. The one and only time I saw one doing something other than standing around! However, I can recommend them for anyone that might find themselves in The Sunshine State – so do check them out if you ever get the chance. Why not subscribe to my YouTube channel or my Vimeo channel.